Go horseback riding through a variety of landscapes during this multi-day tour in Argentina. 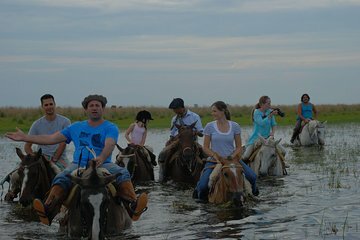 Join local gauchos for scenic rides through marshes, lagoons, and woods. Stay on an estancia on the shores of the Corrientes River with access to fishing and boating. Home-cooked, family-style meals with wine are included. No prior horseback riding experience is required. In case you take the night bus and arrive early in Esquina, there is a surcharge of 75 USD p.p.